Shortly before midnight, two days before the New Year, I heard a knock on the side door of my house. My German shepherd, Walden, started barking. Was it the beginning of a “home invasion” like Canadian city dwellers are apparently getting used to? I don’t live in a city, but in the High Laurentians, 200 kilometres northwest of Montréal. I own the last house at the end of an unpaved country road, where the last utility pole stands. I have only one neighbour, who lives in a mobile home a hundred metres to the south. The closest police station is 35 kilometres away, and the cops would take at least half an hour to get here on winding, icy roads, assuming that they scrambled immediately, sirens and flashers on, as if the prime minister had called his praetorians. I once had a fire scare and phoned the fire department, which is located between my house and the police station. It took 50 minutes for the volunteer firemen to arrive with their two flashing trucks in a cloud of dust, their sirens competing with the wolves howling in the night. Back to the knock on the door. Another strange thing had happened earlier that night. After dinner, an unknown car had pushed its nose in my driveway, and stopped there, engine running and headlights on. I went to investigate. Alone in the car was a young woman. She explained that she was “waiting for somebody from down there.” I knew that if one follows a logging road at the end of the public road, one will find, about 500 metres down the hill, a solitary cabin on the shore of a very small lake called Bear Lake. I don’t know the owners, who are seldom seen around. “Anyway, Happy New Year!”, said the young woman, cheerfully. When I later heard the knock on the door from my upstairs office, my first thought was that something must be very wrong for my neighbour to come at this time. My second thought was that the young woman might need help. I considered taking my revolver with me, but it was “safely stored” (as they say in Newspeak) in my gun cabinet. Since the iniquitous 1991 gun control law, firearms must be locked away without ammunitions. Not only am I not allowed to wear my own registered revolver (revolvers are registered since 1934) in my own house, but I am guilty of yet another crime when I take it out of my door to walk on my own 24 acres of land in the middle of nowhere. Ordinary citizens cannot own handguns for protection of property since 1977, nor for protection of life since 1991. Moreover, my revolver has been declared “prohibited” by the 1995 infamous C-36 “law” (so-called) because of its short barrel. It is a very convenient gun precisely because it is both powerful and short enough to be tucked into one’s pocket if necessary. Mae West had a famous line: “Is that a gun in your pocket, or are you just happy to see me?” But anybody who has read Tintin (whose 75th anniversary we celebrate this year) knows that the poche revolver (“revolver pocket”) is the back pocket in men’s trousers. I turned on the outside floodlight. Through the door window, one or two metres from me, I saw two unknown young men. They did not look threatening, but I would not trust my knowledge of the criminal facies. After all, I am myself a criminal (I don’t always obey their gun “laws,” so-called), even though I don’t look like one. Moreover, one of the men was wearing punk-like earrings. One year before, in November 2002, two retired school teachers, Bob and Bonnie Dagenais, had been killed by two young thugs invading their Val-des-Monts cottage, just northeast of Ottawa. I regretted not to be wearing my revolver discreetly, as an insurance policy. Walden was standing at my heel as ordered, but she is a nice, friendly female, and would probably try to do to the thugs what the state does to honest citizens: lick them to death. Fortunately, I thought, the two guys outside don’t know this. And with some luck, the dog would keep them busy or hesitant long enough for me to run upstairs and retrieve the tools of my liberty. Of course, nothing proved that these men were thugs, anyway. And perhaps I still had time to go and get my revolver before opening the door, but I decided not to. I opened the door. The young men explained that a group of them was partying at the Bear Lake cabin (obviously with girls, one of whom I had met: mystery solved), the car battery used for power had died, and they were in the dark. Waiving a five-dollar bill, they asked if I had candles I could sell. I gave them half a dozen for free, suggesting that the camp owner could just replace them at his convenience. The High Laurentians are not cottage country for bored, politically-correct urbanites, but as much redneck country as you can find in French Canada. 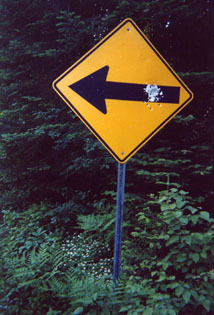 Road signs are often enhanced by bullet holes. People are not fearful, men generally own guns (legally or, now, illegally) and would fight back if attacked, and everybody knows this. Thugs therefore stay clear. What could have been dangerous and scary in other circumstances illustrates how private firearms are useful as last-resort protection, and crime deterrent. Now that laws practically outlaw self-defence, thugs have quickly got the message; hence the epidemics of home invasions. But they chose their places. There is no danger if you live next door to a police station? The truth is that a peaceful and independent individual now has reasons to fear a knock on the door from cops as much as from bandits. For both groups are up against our liberties.